Whether you want to entertain guests, enjoy family time or simply bask in the sun on your outdoor patio, the Austin Outdoor Sectional will cover your bases and give you everything you would need to do so. The Austin collection is offered as a sectional or as fixed individual units. Shown here is the Austin wicker sectional in the color Kubu. This consists of a left and right arm end chair, 2 center chairs and 1 corner chair. We also added the Austin coffee table to complete the look. Designed in large, generous pieces, with sThe Austin collection is designed for extreme comfort. The seats are wide and deep and beg to be relaxed on. 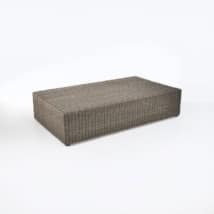 The sleek lines of the wicker frame keep it from looking bulky, so that you get a sophisticated and contemporary outdoor seating collection. The Austin collection is made with Viro outdoor wicker and a powder-coated aluminum frame. 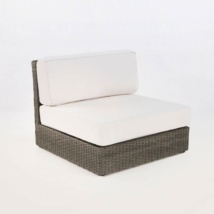 Our wicker furniture is made with the best quality materials, which are suitable for outdoor use. The powder-coated aluminum frame keep the structure strong, but yet light enough to move around your patio. The detail in the wicker weave is stunning. The warm brown tones go beautifully with our Canvas colored Sunbrella® cushions. The Sunbrella® cushions are included in the price as shown. Throw pillows are sold separately, please ask our sales associates for details. It is important to keep your outdoor furniture clean and free from debris to keep it looking it’s best for years to come. We recommend cleaning the wicker with warm water and a mild soap. It is best to keep the cushions covered or indoors during harsh weather. Teak Warehouse is committed to making the most high-end outdoor furniture at wholesale prices. We take pride in our designs, quality and service. We hope you find what you are looking for, if you have any questions please call us at 800.343.7707. We are open 7 days a week to the public and trade.trong lines and gorgeous, thick panels of wicker which reach the floors. Augmenting your space to its full potential; try configuring the Austin Suite into a lavish setting in a large area with a combination of pieces. Start with an Austin Sofa, making a vast ‘C’ shape around it, with the addition of two Corners, several Centers, and a Austin Left and Right Arm Chairs at either end. Perhaps you have a modest patio that needs a bit of a makeover? How about a Corner unit with three Centers, creating a humble ‘L’ shape that you will be able to both lay out on or host guests for smaller parties. The smooth linear design and low profile of this suite allow it to warm up, wake up, and wise up any area! The Austin Collection is made from all weather, marine grade products: powder coated aluminum, Viro® wicker and Sunbrella® cushions.